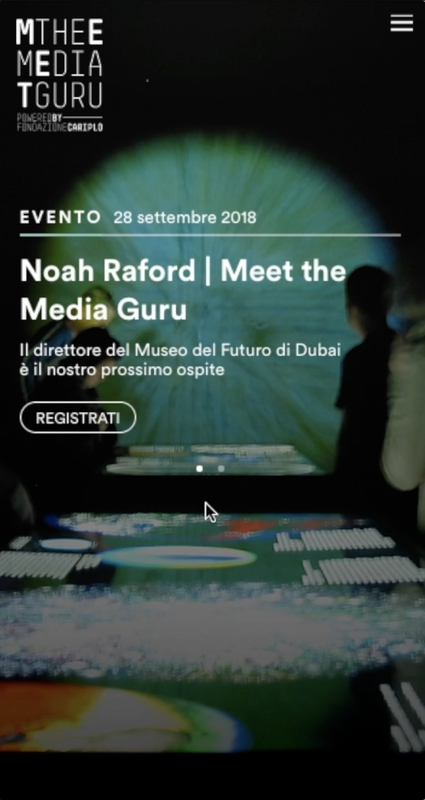 A celebrated cycle of conferences evolves into a permanent physical space open to the city and entirely devoted to digital culture: how can we reimagine its vast video and content archive and transform it into an open digital platform that will support the center’s activities for the years to come? Meet the Media Guru, directed by Maria Grazia Mattei, was established in 2005 as a platform of knowledge exchange and meeting that invites in Italy the excellences of international digital culture, bringing together creative ideas and innovative projects to reduce the digital cultural divide and promote active participation through meeting and inclusion. 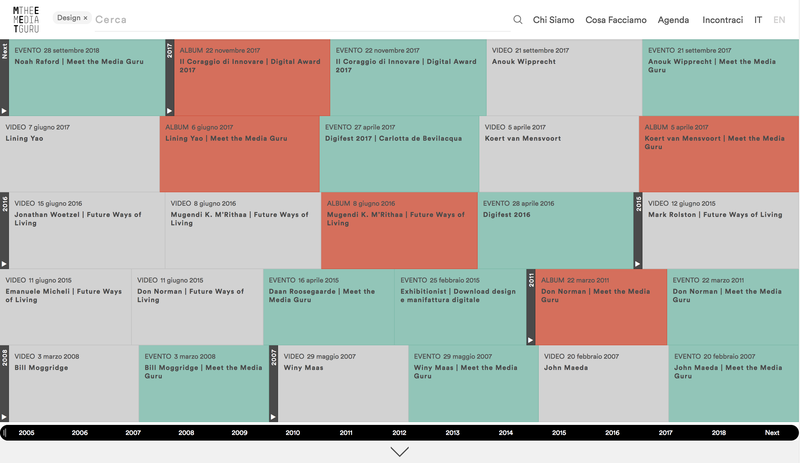 In 2018, thanks to a partnership with Fondazione Cariplo, it evolved into the first Italian international Digital Culture center. This evolution revolved around a radical brand transformation: MTMG became MEET and was in need of a completely reimagined digital home for its vast content archive. Accurat conceptualized, designed, and developed both the back-end and the front-end of MEET’s new online presence: a dynamic archive of information that revolves around a data-driven searchable timeline that brings together videos, events, articles, contents and paints a colored picture of the center’s many activities and interests. 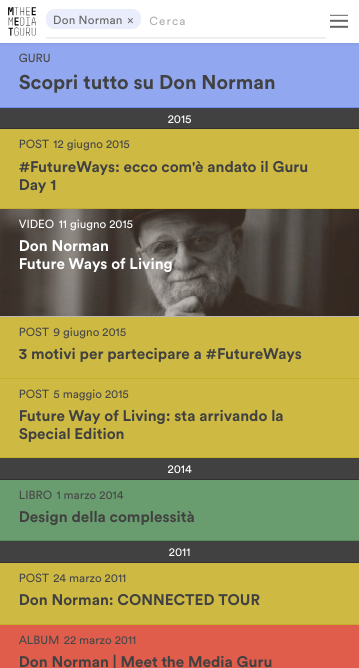 The visual timeline dynamically adapts to the number and type of results and to the screen size. 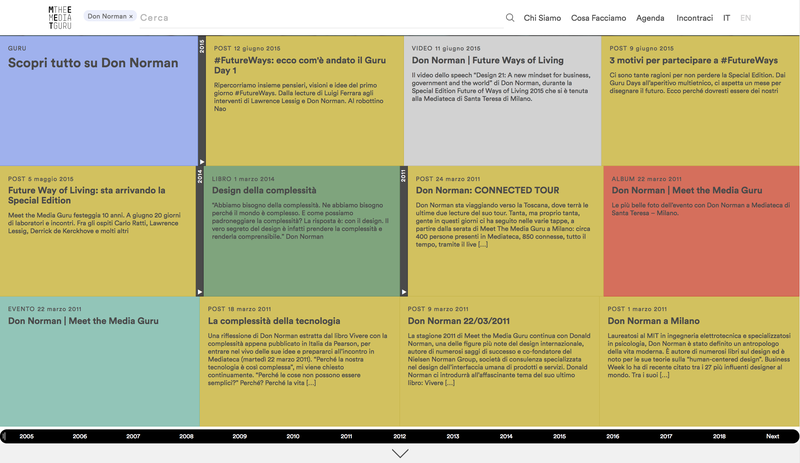 The platform is built around a dynamic visual timeline of all the past and future contents of the center, that can be explored from different perspectives: all contents, independently from their format, are classified according to multiple interplaying criteria in a searchable database and are easily available thanks to a custom tag-based search engine. A color-coding system identifies the different types of media, that dynamically rearranges over the timeline according to the user’s choices. 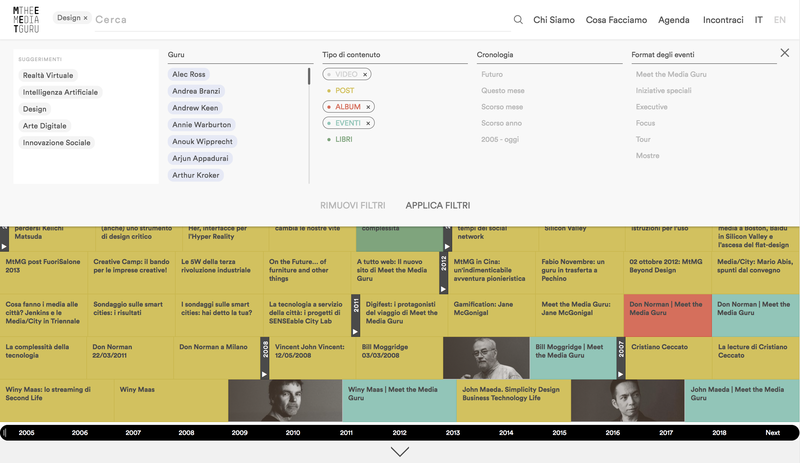 The responsive layout of the visual timeline adapts to the screen thanks to an algorithm that computes the size of the individual modules according to the number of results of each search and the size of the screen. This allows to produce infinite dynamic visualizations for the results that invites users to explore the archive while enjoying an ever-changing but always clean and visually appealing experience. The visual search engine automatically suggests possible combinations of tags and is built around on a color-coding systems that clearly identifies contents and metadata. 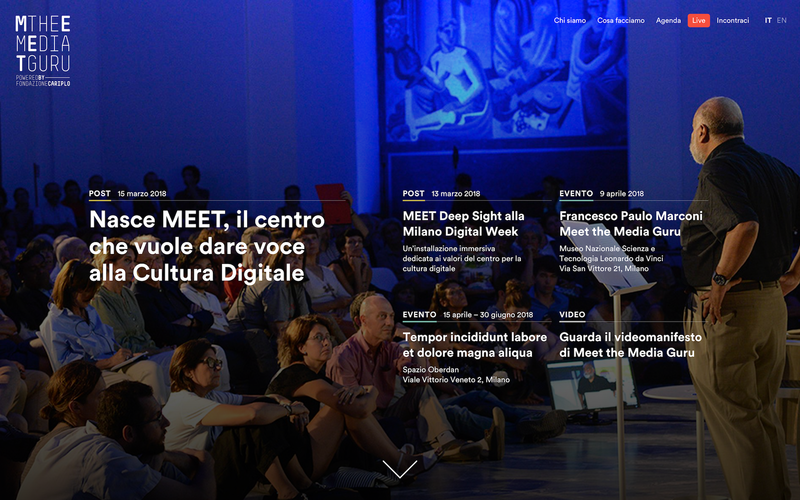 The radical brand transformation from Meet The Media Guru to MEET was directed and orchestrated by the volcanic force of one of Italy’s most celebrated creatives, Paolo Iabichino, Chief Creative Officer at Ogilvy Italy. Paolo brought together a stellar team of experts to guide this transition and worked side by side with Accurat at the overhaul of the center’s digital identity. Accurat’s team started from an in-depth mapping and classification of the organization’s content archive and imagined and built the digital experience directly around this invaluable and ever-evolving asset: the design of the architecture of the platform was organically driven by the structure and richness of its contents, enriched by a custom tagging system developed specifically for the project. The user interface has been refined to reflect the visual themes defined in the center’s new branding, developed by the team led by designer Alessandro Boscarino. The responsive and adaptive design of the platform’s interface dynamically adapts to all ratios and resolutions, providing a harmonic experience on different devices. 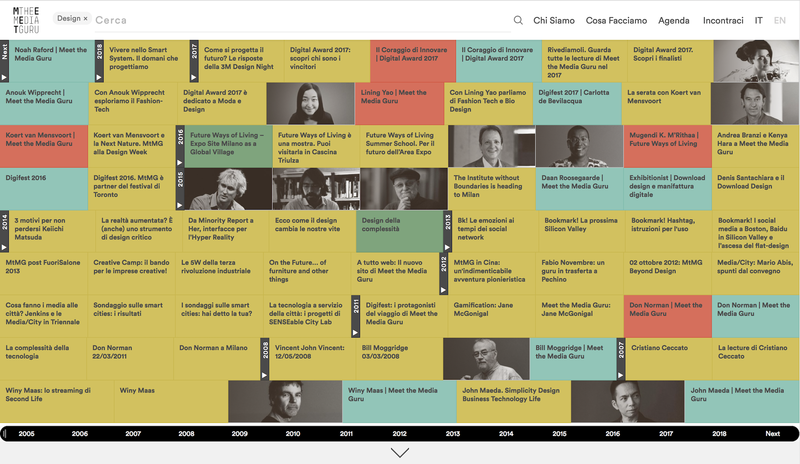 The core of the platform, its visual timeline, redefines the way contents are presented in a web search: the output assumes infinite and diverse identities that reflect the harmonic composition of the many different topics and media in the archive, becoming itself a powerful and central piece to MEET’s visual branding. 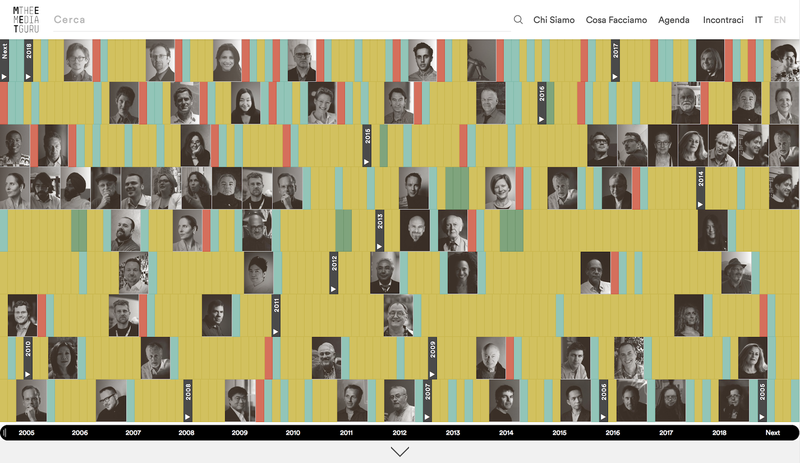 The collection of results dynamically evolves in front of the user’s eyes from dense and colorful textures mirroring the cultural richness and nuances of a library’s shelf to monolitic blocks of color, that transform the interface in a brutalist manifesto for a new digital culture.